Casita is a 3 bedroomed static caravan on Newquay View Resort. Nestled in a beautiful valley but only a 15 minute walk to the beach. 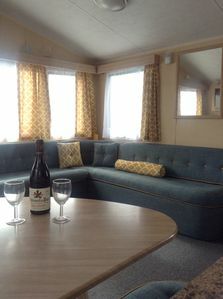 The caravan sleeps up to 8 people with a double bedroom, two twin bedded rooms and a double sofa bed in the living room. All bedding and towels are provided and there is free wifi in the home. On site there is a large heated indoor pool, an outdoor heated pool (seasonal) a sauna, steam room and kids play area. These facilities are free for guests at Casita. The site is a 15 minute walk to Porth beach, a lovely stroll along the cliff path to Watergate bay will take approx 40 minute. Newquay town centre is approx 2.5 miles away. Any booking made is for a privately owned caravan.peter Bull Resorts ltd has no association with the hire of this holiday home or legal responsibilities associated with a holiday booking. Peter Bull Resorts ltd holiday accomodation terms and conditions Do Not apply to this booking. This is a private hire contract managed by, and made directly with, a holiday home owner on a Peter Bull site.